Loyola University’s new Institute of Environmental Sustainability focuses on environmental science but is designed to demonstrate what sustainability is all about. E Cube provided full building commissioning services for this project. Chicago Tonight News features the project. 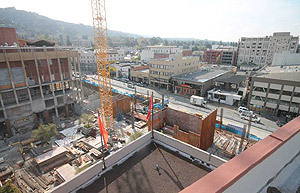 UC Berkeley’s Sproul Plaza Redevelopment project can be tracked via webcam and interactive archive calendar. E Cube is the commissioning agent on the project which will be complete in fall 2015. ASHRAE’s High Performance Buildings Conference, in San Francisco April 7-8, 2014, includes a session titled: “Benchmarking and Retro-Commissioning: Driving Existing Building Performance.” E Cube’s President Len Rozek, an expert in new and existing building commissioning, will be attending the conference and special LBNL FLEXLAB tour.